Vivitek has launched the DH768Z-UST laser projector to expand its existing D760Z Series and offer greater laser ultra short throw choice to the user. The DH768Z-UST is suited to environments that need to replicate exact colours or shades – such as a museum or gallery that wants to project an image of a painting or another work of art in its true colours. 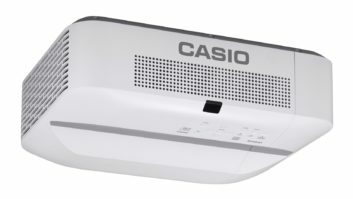 Thanks to its shape, size and UST technology, the DH768Z-UST is also a good option for customers who may not have enough space for a conventional projector or in venues where mounting to the ceiling is complicated. Its ultra-short throw projector design features an embedded reflective mirror. This allows for a projection size of 80in to 150in diagonal from just 40cm away from the screen. The close positioning of the projection surface also eliminates shadow from presenters or visitors standing close to the screen. It includes Full HD 1080p and WXGA resolution and the DH768Z-UST boasts an advanced laser phosphor light engine for superior brightness and colour uniformity matched with a high 3,100 ANSI lumens of brightness and a crisp 12,000:1 contrast ratio. In terms of set up, the manual zoom and focus provide both easy adjustment and positioning flexibility. The DH768Z-UST offers a wide array of connectivity options, including two HDMI options, component, composite video, s-video and VGA-in/out, while the embedded 10W audio speaker and multiple audio-in and audio-out ports provide plenty of options for external device connection. The model also offers 3D functionality support and is network ready for integration, monitoring and management via RJ45. Meanwhile, anti-theft security features include a Kensington security slot and PIN lock keypad to ensure that these desirable solutions remain in place.